Did you know that many first aiders are no longer able to demonstrate effective CPR only a short time after attending a course? After 6 months it has been shown that skill retention may be as low as 10%. LifeSaver Training holds regular CPR skills review workshops, where attendees can practice their CPR skills under the guidance of one of our highly qualified Instructors. 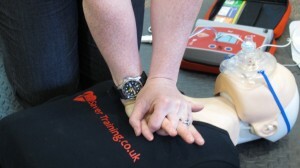 The CPR skills review workshop is open to anyone who holds a current CPR certificate. For further details on upcoming workshops, please give us a call on 0151 207 0081 and we will be happy to assist you.